Branding strategies go a long way in making any business unforgettable to customers, and that includes the home services industry. When you have a strong and recognizable brand, you start to become a business that’s reliable and appealing to customers. The more people connect your brand to the types of home services you provide, the more likely they are to view you as their go-to company. A brand involves your company name, slogan, and logo, but it goes deeper than that. The brand is ultimately how customers perceive your business. Think of a brand – say Apple, Pepsi, or Google. These are big brand names that you likely have a strong impression of. You think of their services and company goals just by hearing their name. That’s what effective branding can do for a business. You didn’t just come to recognize these brands out of the blue one day; these companies did the work to create the brand image they wanted through advertising, slogans, and service. And while your goals may not be to become a globally recognized company, your home services business can still benefit from effective branding. Strong branding means that a business is memorable, appealing, and relevant to new and existing customers. You likely want your home services business to be all those things. After all, when customers recognize your brand, they can easily pick you out from a list of service providers, remember what you stand for, and have a desire to work with you, be it conscious or subconscious. When you’re a recognizable part of your potential customer’s mind, they’re more likely to choose you over your competitors. And when that happens, you’ve got more business headed your way. Align your brand with your business mission and values. Keep your brand consistent across all aspects, especially when it comes to your online presence. Use online marketing to raise brand awareness through a website, ads, SEO, and content marketing. Effective branding can help increase customer perception of your services and increase the number of jobs. 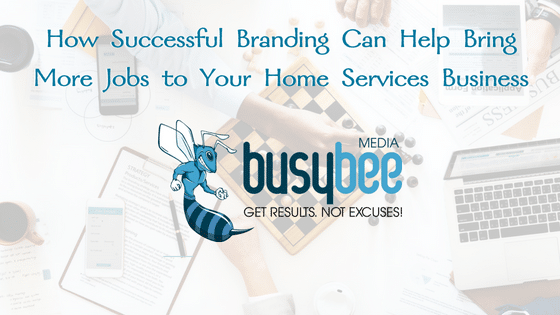 For help with developing and executing your home services business brand strategy, contact Busy Bee Media today!